Dr. Pepper is one of the most famous soft drinks on planet Earth, and if you tried it once, you'll never forget its unique, exciting taste. That's what the giants in the industry put first - the drink has to be addictive. So, we all like to drink it on occasions, some people drink more than a bottle per day, but none of us know anything about it - anything interesting, I mean. However, it's been around for almost 150 years (! ), and that automatically means that it's got some crazy stories to tell. With that said, I want to welcome you all to my list of amazing facts about Dr. Pepper, one of the greatest drinks that humanity (the Americans, I mean) ever created. - So, Dr. Pepper is a soft drink that comes with a very special flavor. It was invented by Mr. Charles Alderton in Texas and was first sold in...1885! Aha, it's been around way before we got the first black-and-white Televisions, not to mention computers. - It's the oldest brand in the United States that makes soft drinks. The "official definition" is "pepper-style soft, carbonated drink". I know, it doesn't sound very tasty, but it is what it is. - An amazing fact about Dr. Pepper: Back in 2008, Dr. Pepper claimed they would give everyone a free bottle if Guns N' Roses would finally release the album that they've been working on for a decade. The album, by the way, did see the light of day that same year and was titled "Chinese Democracy". - Did you know that there's a whole museum (!) in Waco, Texas (yep, that's where the drink was first served) dedicated to this drink? Well, it's true! Oh, and back in the day, when Dr. Pepper didn't have a name yet, folks just called it "Waco". I'm not really sure why they changed it because I believe the original name was kinda cool :). - More amazing facts about Dr. Pepper: To be fair, nobody really knows who, how and why gave the drink this name - it's a huge secret! Some people claim that Wade Morrison, a store owner to whom Mr. Alderton offered the drink first, gave it the name. Others say that it was named after Mr. Morrison’s sweetheart's dad. Crazy, right? - Charles Alderton was working in his "lab" in Morrison’s store and came up with the drink's formula - he was a pretty great pharmacist, just like Caleb Bradham, the man who invented Pepsi, another super-popular drink. - It's well worth mentioning that rock legends like RHCP (Red Hot Chili Peppers) and Aerosmith said once that it's their favorite soft drink. This is definitely an amazing fact about Dr. Pepper, am I right?! - Overall, there are as much as 23 different flavors of this drink in America and other countries around the world. 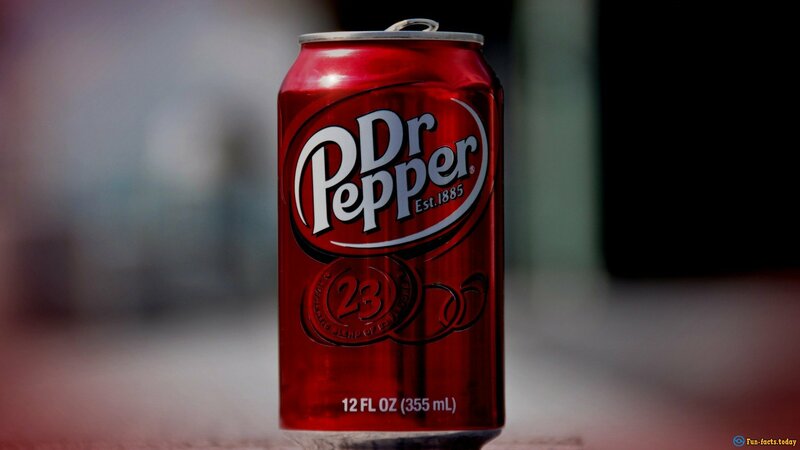 The very first new line-up of flavors was introduced in 2000; among them was the Diet Dr. Pepper. They say if you add lemon to Dr. Pepper you'll turn it into a hot drink. Have you ever tried that? - Despite popular belief, Coca-Cola and/or Pepsi are NOT the owners of the drink - the Dr. Pepper Snapple Group is. The company was established in 2008. Alright, that's it for the fun facts about Dr. Pepper!